They allow for flexibility according to ingredients on hand. They encourage creativity in incorporating flavors and sauces enjoyed or desired by family members. They allow for flexibility in feeding individual members of a family differing amounts of protein and carbohydrates, as their individual needs require. They incorporate all necessary components of a well-balanced diet — healthy protein and starch/grain sources, in addition to other add-ins, such as vegetables. They can incorporate a varied rotation of healthy protein and carbohydrate sources without relying on a recipe. They keep meal preparation simple because they lend themselves to preparations made ahead of time. 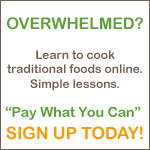 See Planning Ahead for Hassle-Free Healthy Cooking for more information. What is a Skillet Dish? A Skillet Dish is a one-dish meal (usually) that incorporates healthy sources of protein, starches/grains, sauce (for flavor and moisture) and other add-ins. It doesn’t have to be made in a skillet, though. You could use a crockpot or a stew pot. But the idea is that you’re making one dish that satisfies all the dietary needs of a given meal, while enjoying endlessly satisfying variety. Most people enjoy Skillet Dishes frequently, but perhaps don’t recognize them as such, nor do they realize how beneficial and enjoyable it may be to create them for their families on a regular basis. Did you know that a hearty stew or a stir-fry served over brown rice are examples of healthy Skillet Dishes? Creating a Skillet Dish takes a little thinking and perhaps a little preparation ahead of time, but once you’ve done it a couple of times, the hurdle of getting your mind around the idea will come more naturally. There are four steps — 1) Select the Components; 2) Prepare the Components; 3) Choose the Style; and 4) Put it All Together. In order to create a Skillet Dish, you must start by choosing your main source of protein and starch/grain. The following lists should give you some ideas. Pasta — Whole Wheat, Sprouted Grain, Brown Rice, etc. Beans — pintos, kidneys, black beans, Great Northern, navy, lentils, etc. *To soak and cook grains, see these instructions. Herbs & Spices — basil, parsley, oregano, thyme, rosemary, sage, dill, cumin, paprika, curry, cayenne, ginger, etc. You may be thinking, “Okay, this is a little overwhelming. I don’t know what to choose!” I would encourage you to create your very first Skillet Dish by taking cues from a recipe that your family loves. Every recipe has a signature flavor. Start with that. 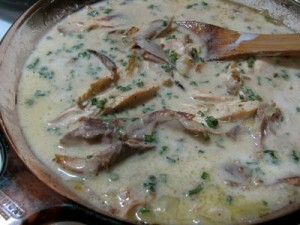 You may have to make adjustments, such as adding a bit more of one herb or spice, or by adjusting the amount of liquid. Once you try a few Skillet Dishes this way, you’ll soon gain the confidence you need to branch out and test your own inspiration. However, it is always a good idea to cater to your family’s tastes when choosing flavors. For instance, I don’t know that I’ll ever cook with curry again because every time I have tried it, most members of my family couldn’t stand it. So that’s not a flavor that works for us. On the other hand, we love tomato and dill, so I do that often. Finally, your Skillet Dish has room for add-ins, such as vegetables. If you didn’t choose beans for the main grain/starch, you may wish to add some beans as an add-in. Beans are wonderful for stretching the meal and adding fiber. Vegetables (fresh or frozen) — broccoli, cabbage, onions, tomatoes, celery, carrots, green beans, kohlrabi, peas, bell peppers, etc. Nuts — (soaked) toasted sesame seeds, slivered almonds, toasted cashews, chopped walnuts, etc. Others — sliced or diced olives, grated cheese, chopped fresh herbs — cilantro, dill, basil, mint, etc. Spend a little time thinking about how to prepare each component. As you get used to the idea of making Skillet Dishes, this will become easier. Two of the components may require preparation ahead of time — the protein and/or the grain/starch. You will thank yourself for preparing some meats ahead of time, such as roasts, stew meat (for tenderness) or whole chickens. Not only will the meat be more enjoyable due to being cooked properly, but you will put the dinner together much more quickly since the protein source is already prepared. Often, I plan to have Skillet Dishes two nights in a row, in which case I prepare a double amount of the protein source and set aside half of it for the next night’s dinner. No one in my family feels as though they are eating leftovers because I change some of the other components for the second night’s Skillet Dish, giving it a different flavor, look and feel. How far ahead of time you prep your grain/starch depends on which source you choose. Some of the grains can be started in the few hours before dinner. You may wish to prepare a double batch and set aside half of it for a Skillet Dish on a subsequent evening. If you’ve chosen beans for the grain/starch, they should be cooked ahead of time. Why not cook up a big batch, and freeze the excess so it will be ready to go for another Skillet Dish the following week? The other two components — sauce and add-ins — lend themselves to being prepped and incorporated while you put together the Skillet Dish, so they require less thought and attention. However, it is always a time saver to wash and chop vegetables earlier in the day if time allows. This will largely depend on the components you’ve chosen. The “style” of your meal will determine the kitchen hardware required for cooking the finished Skillet Dish. A good stock pot performs best for a hearty stew. A large cast-iron skillet works well for a stir-fry or meat in a thick sauce that will be served over rice or quinoa. And either a large cast-iron skillet or a casserole dish serves wonderfully for creating a casserole-type meal. The cast-iron skillet will keep it warm on the stove top or the casserole dish with lid can be baked in the oven, bringing the whole meal to a bubbly and warm state. You choose what works best for the Skillet Dish you have in mind. There is no hard and fast formula for how you’ll put your Skillet Dish together. A bit of intuition will help you plan it out. But in general, you need to cook any raw ingredients (any vegetables and/or uncooked protein sources such as chicken) and then incorporate the cooked ingredients and the sauce ingredients. In cooking Skillet Dishes, I might end up with a large cast-iron skillet full of mouth-watering, warm, flavorful healthy food. Other times, the end result will be a stockpot full of hearty ingredients with a uniquely flavored broth. Sometimes in a lidded casserole dish, I will mix together cold, cooked ingredients with sauteed vegetables, then pour a sauce over the top and bake for about an hour at 350 degrees. The greatest benefit for me about a Skillet Dish is that I don’t have to be a slave to a recipe or technique. Rather, the meal is the result of what works best for my cooking mood and what I have on hand. This frees me up to enjoy cooking because I don’t feel limited. I will leave you with one final thought. I encourage you to start creating Skillet Dishes with ingredients you know well and have confidence using. Then branch out, incorporating a variety of flavors and ingredients. Your diet will be more healthy, you won’t feel limited to following a recipe and your family will rarely be bored with the same old meals again. Want more? Skillet dishes is a full-blown lesson with video demonstration in the Fundamentals eCourse. Also, see this post for skillet dishes created by eCourse members. You'll be inspired! © Copyright 2006-2010 by Wardee Harmon. I would really love some gaps friendly skillet dish ideas! navy beans and lentils are allowed.